Review: "I didn’t think of myself as a boy or a girl -- I never have. I would just think of myself as a boy or girl for a day. It was like a different set of clothes." 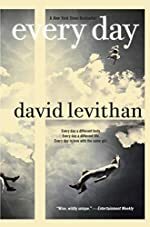 David Levithan has taken a unique look at adolescence through his novel Every Day - a story about A. Every night A goes to sleep, and every morning A wakes up in someone else’s body. A is used to this as it’s been the routine since birth. However, when A wakes up in Justin’s body, everything changes. Through Justin, A meets Rhiannon -- a beautiful yet unhappy girl who changes the way A looks at the world. Because of Rhiannon, A finds the rules begin to change. No longer can A avoid being noticed. No longer can A not interfere. And most importantly, no longer can A avoid becoming too attached -- because A is in love. Even if A is able to reach out to Rhiannon and convince her that although he changes daily, he wants to be with her always, how can two people really be together when one of them can never predict who or where he’ll be in the morning? Creative doesn’t begin to describe Levithan’s latest novel. Every Day centers around a theme of love and the sacrifices people make for love. Never, however, has that theme been exemplified in such a unique fashion. Through A’s life, readers’ eyes are opened to so many different lifestyles. Every Day chronicles 40 days in A’s life, and with each day comes new challenges. A experiences a drug addict, a suicidal teen, a family with strict rules, a family with no rules. It’s like experiencing 40 unique characters in one! Aside from the obvious storyline, readers enjoy the little snippets of every life A enters. While inhabiting the lives of these different teens, readers learn more and more about A’s character, and they will find themselves wishing as much as A that he and Rhiannon can find a way to be together. Every Day is not only a fascinating exploration into character study, but it is also a love story that will leave readers wanting more. Young adult readers will not be disappointed! We would like to thank Random House for providing a copy of Every Day for this review. Have you read Every Day? How would you rate it?